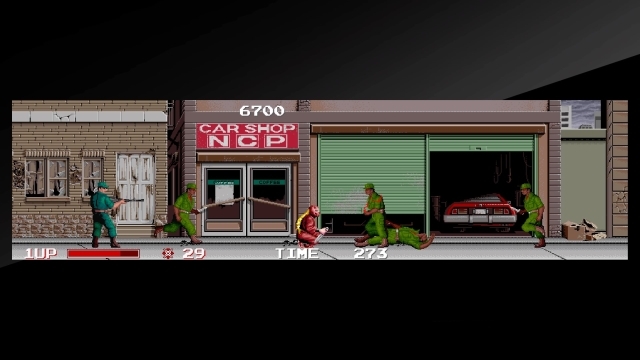 A side-scrolling arcade game released in 1987, The Ninja Warriors takes place in the distant future of 1993. Unbeknownst (?) to the public at large, the President of the United States, the superbly-named Banglar, is a demon king, and has enforced martial law. Using the situation to throw the country into further disarray, scientists have dispatched two ninjas, one of which is donning a fluidly-animated ponytail, to fight this military might and overthrow the government. To sabotage and destroy in a discreet manner? No; to walk out openly in the streets, military bases, and shopping districts, causing bloody chaos by swiping their kunai and tossing shurkiens. And they're not just ordinary ninjas... they're mechanical ninjas! If that whole paragraph doesn't sound like a video game straight out of the 1980s, then I don't know what does. The 80s tinge doesn't end there, as Taito's sound team, Zuntata, lent their talent to the soundtrack. Better known for their contributions to the Darius series, the crew often incorporates a unique, synthetic vibe into their works, with some experimental sounds thrown here and there. In this game's case, a lot of the more upbeat tunes are clearly meant to mimic guitar riffs and percussion beats for a synth rock feel. All this while knife, rifle, and grenade-wielding soldiers charge your smooth-striding ninjas amid standard, but very detailed backdrops. The damaged city block in the first stage, for example, has visuals that include a faded Coca-Cola sign, a DJ BOY club/store, and even a couple of parked Pontiac Firebirds. How much more 80s can you get? You'll have plenty of time to view the landscape, as Taito used the same widescreen technique they performed on 1986's Darius. While all you'll see is a "simple" wide view encased in black bars for this Arcade Archives port, the original arcade game had to accomplish trickery to make this work; placed inside each bulky cabinet are three monitors, two side monitors and a middle bottom monitor that, with the help of a mirror, gives the illusion of a huge screen. And just like Darius, this broad spectrum allows players ample opportunity to counter against the onslaught of foes and other odd confrontations rushing the battlefield. Helpful, because in addition to each enemy type having their own attack pattern, they also have punishing counters based on whether gamers are standing or crouching. Considering how The Ninja Warriors was given the wide screen treatment, something that's obviously on the expensive side, it's clear Taito wanted to make an impression. They seem to have succeeded in nearly every area, from presentation and visuals, to the catchy music... and then made the actual inner-workings of the game an afterthought. More times than not, the action is incredibly repetitive, since you're literally just waiting for soldiers to run up to be disposed of, over... and over... and over. You get the occasional rifle man or grenadier attacking from a distance, but then it's right back to standard fodder. What makes this more irritating is, as implied earlier, the screen scrolls at a leisurely pace. Doesn't help that each stage intentionally takes a long time to walk through; I have an inkling the devs did this on purpose to show off their the screen's girth. There's another problem: when the game actually includes real diversity with the presence of specialized, tougher foes, it doesn't improve things. In fact, they add to the agony. Yeah, they're supposed to be hard, a very common trait in video games to separate grunts from actual challenges. But the way these enemies were designed, how absolutely difficult it is to penetrate their defenses, makes it feel less like you're piecing a puzzle together to unravel a weak point, and more like you're trying to break the game in the hopes of discovering an exploit. The red-haired, ponytail ninja boss at the end of the first stage, for instance, can be put into a jumping exploit if you attack her the moment she appears; if you fail, then you have to take several, needless injuries to force the ninja out of her defensive shell. The tank encounter in stage two is ridiculous, because it requires precise hits from your limited stock of shurikens. What if you run out? Well, you just have to die. The Oni-masked ninjas, who mimic actions, are the bane of my existence, especially since two usually appear at the same time. I would rather jump over and attempt escape than get into an awkward duel where 90% of my health is drained... Worse, the game sometimes make you fight these combatants while normal enemies flood the screen, making for a crowded nightmare. You can imagine what the intentionally-cramped sewer stage is like. It's not like I dislike this category of action where enemies pack the screen, either. I can gleefully plow through hundreds of soldiers in most Metal Slug releases, tensely knife everyone in Rush 'N Attack, or "karate chop" fools, pots, and dragons in Kung-Fu for the NES. The Ninja Warriors share a lot in common with these titles in terms of design and flow, except Taito's anarchic caper performs the template poorly. Tedious action, overly-difficult, special enemies meant to drain lives (coins) from players, and an overemphasis on pimping its wide-screen aesthetics dampen what could have been a fun, yet average side-scroller. 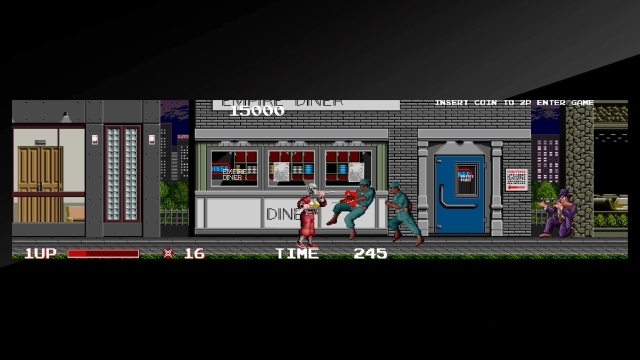 If you enjoyed this Arcade Archives: The Ninja Warriors review, you're encouraged to discuss it with the author and with other members of the site's community. If you don't already have an HonestGamers account, you can sign up for one in a snap. Thank you for reading! None of the material contained within this site may be reproduced in any conceivable fashion without permission from the author(s) of said material. This site is not sponsored or endorsed by Nintendo, Sega, Sony, Microsoft, or any other such party. Arcade Archives: The Ninja Warriors is a registered trademark of its copyright holder. This site makes no claim to Arcade Archives: The Ninja Warriors, its characters, screenshots, artwork, music, or any intellectual property contained within. Opinions expressed on this site do not necessarily represent the opinion of site staff or sponsors. Staff and freelance reviews are typically written based on time spent with a retail review copy or review key for the game that is provided by its publisher.